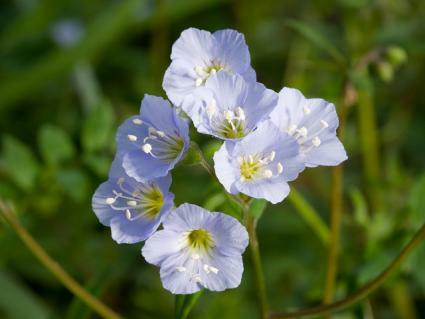 Polemonium, commonly called Jacob's ladder or Greek Valerian, is a perennial woodland plant from northerly and high elevation regions of North America and Europe. Its delicate foliage and tender purple blossoms make it a well-deserved favorite for shade gardens. Greek Valerian is also called Jacob's ladder because of the ladder-like arrangement of its small elliptical leaves as they climb the stems of the plant. Its bell-shaped blossoms appear atop two-foot stalks in mid-spring, though it will occasionally bloom again in summer if the plant is deadheaded. Heat is the one thing that Jacob's ladder does not like. It is a poor choice for the southern states, growing best where summers are cool and damp. In its ideal climate Jacob's ladder will tolerate full sun, but it is best in partial shade and is capable of tolerating full shade. The plants spread to form clumps and may seed themselves to form extensive colonies, making it a good choice for a naturalized woodland setting. They go dormant in winter and often look shabby in summer, so it's a good idea to intersperse them among other species that will complement their growth habit, such as low, widely spreading groundcovers like creeping Jenny. 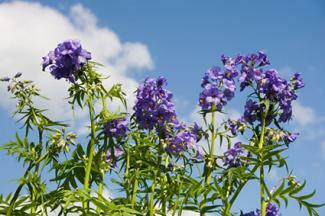 Fall is the best time to put polemonium in the ground, though spring plantings are also successful. They need rich, well-drained soil - moist, but not wet. They do best in an established forest environment, but lacking this, their preferred growing conditions can be replicated by incorporating several inches of compost over the planting area. Greek Valerian can be deadheaded after flowering in spring and then cut completely to the ground after the first frost in fall. At this time, spread a one-inch layer of compost over the roots to provide nutrients for lush growth the following spring. Every three or four years the plants can be divided. Using a spade, slice into an existing patch and separate it into eight to 10-inch clumps for transplanting into new locations. Divide polemonium in spring for best results. Slugs are the number one pest affecting Jacob's ladder. They love the tender, succulent leaves, especially in spring when they emerge from the ground. If they get out of control, try one of the many types of slug control, from diatomaceous earth to beer traps. Jacob's ladder is a fairly obscure plant, but there are several named varieties available that broaden the options for flower color and leaf form. Album is similar to basic species, except it has white flowers. Bambino Blue has blue flowers on short stalks. 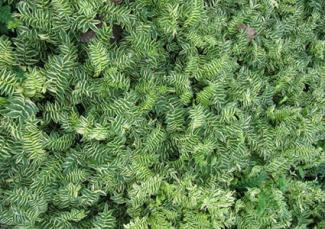 Brise d'Anjou has variegated foliage with blue flowers. Greek Valerian is an exquisite, refined plant that creates a light airy feeling in woodland gardens alongside violets and hostas. In the right environment it is very easy to grow and long lived, sowing itself to form undulating drifts of its dainty purple flowers each spring.